It all starts as a boulder of jade, formed by still-unexplained forces beneath the crust of the earth. Cut into blocks and then into thin slices, jade begins to take shape. But before anything can really be made of the jade, a design must be devised. 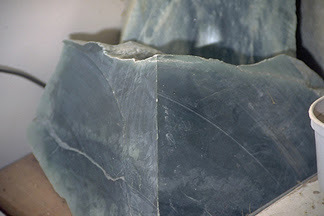 Join Stuart Stephenson of London, England as he designs and makes his piece of jade. There are many options for a design. 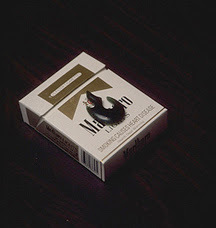 You can choose a traditional design, such as the common fish-hook or a spiral of various kinds. 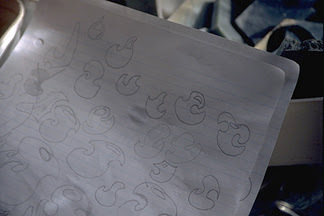 Or you can design your own, which involves drawing and re-drawing in search of just the right form. Stuart went through several pages of paper before deciding on the piece he wanted to make. It's just third from the right on the top row, above, looking a bit like a flame. 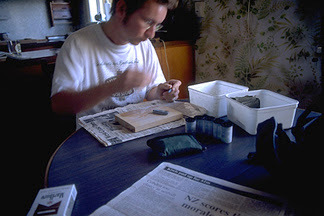 Now it's a matter of grinding a larger piece of jade down to the size and shape Stuart needs. He starts with a piece of jade just about the right size, and steps over to the bench grinder. 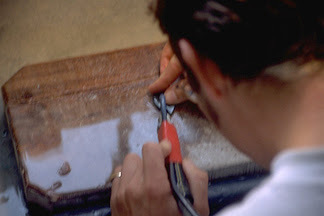 It starts with a very rough grind, as shown below, by the hard sharp edge of the piece. 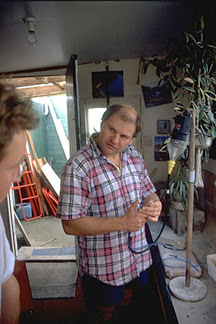 Gordon Wells, the jade carver who supervises and instructs along the way, demonstrates each step before letting Stuart take over. 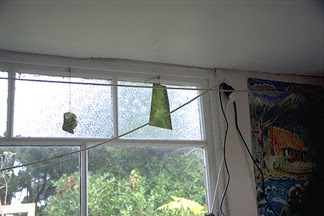 The grinding isn't very fast work, because jade is very hard (8 on the Mohs scale). Even synthetic diamonds (not quite 10 on the Mohs scale) have a tough time. After a while, though, the piece begins to take shape. When the design is finally roughed out with the grinder, it's time to put in the details. For the finer, closer work, a drill is the best tool. It has a silicon carbide tip as well, and, like the grinder, has a stream of water directed on it to cool the drill and the jade, as well as to carry away the fine jade dust. Gordon demonstrates how to use it. 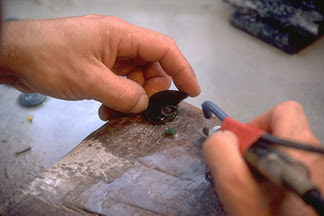 The first form is made by drilling a hole straight through the jade and then widening it in the intended direction. 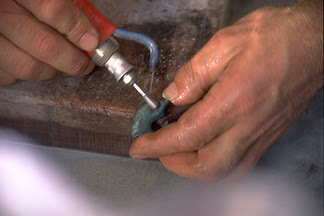 This is a technique developed by the original Maori jade carvers, who realized that rubbing away pieces of jade was harder than going through it (which was hard enough, but removed more jade for the same effort). 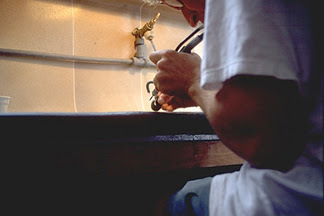 Stuart continues to drill the design into the jade, working carefully to avoid error. Error is possible, but because of the hardness of jade, very unlikely and minimal if the carver is paying any attention at all. It takes a significant amount of effort and time to do anything with jade, intended or not. 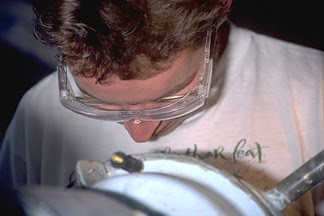 Moving the piece and the drill around to get the best angle, Stuart begins to be able to see his design take shape. 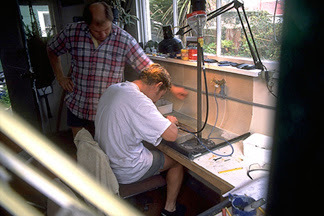 Gordon watches carefully to be sure Stuart is using the tools properly. 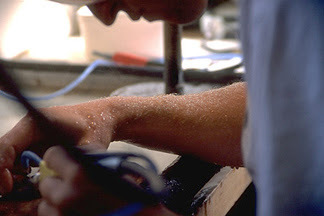 When the form is finished, Stuart then has to round over the edges. Gordon helps out, checking Stuart's progress and doing some of the truly challenging parts himself. 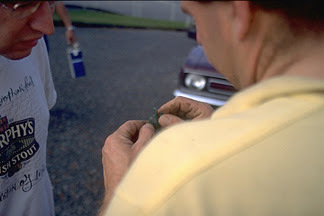 Then he puts Stuart back to work on the rest of the piece. After the piece is finished drilling, it's time to polish the jade. Sanding puts the final polish on the jade. It takes a long time, longer usually than the grinding and drilling. It's done by hand and acquaints the carver intimately with the piece. There are five levels of sanding paper, increasing in fineness from 150 to 1200. 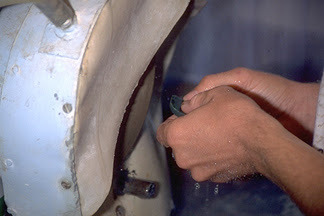 The process involves sanding, rinsing in water, and sanding again. 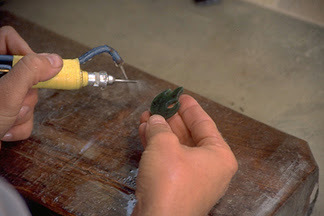 The jade must be sanded wet until the very final step, when it is buffed dry before polishing. Stuart sands and sands. Each time he must check with Gordon before progressing to the next fineness of sanding paper. At long last, after several hours, the piece is finished!